#1 Hot Chocolate (Myron Reed & Sugar Dunkerton)-What do you get when you mix sugar and hot fire? 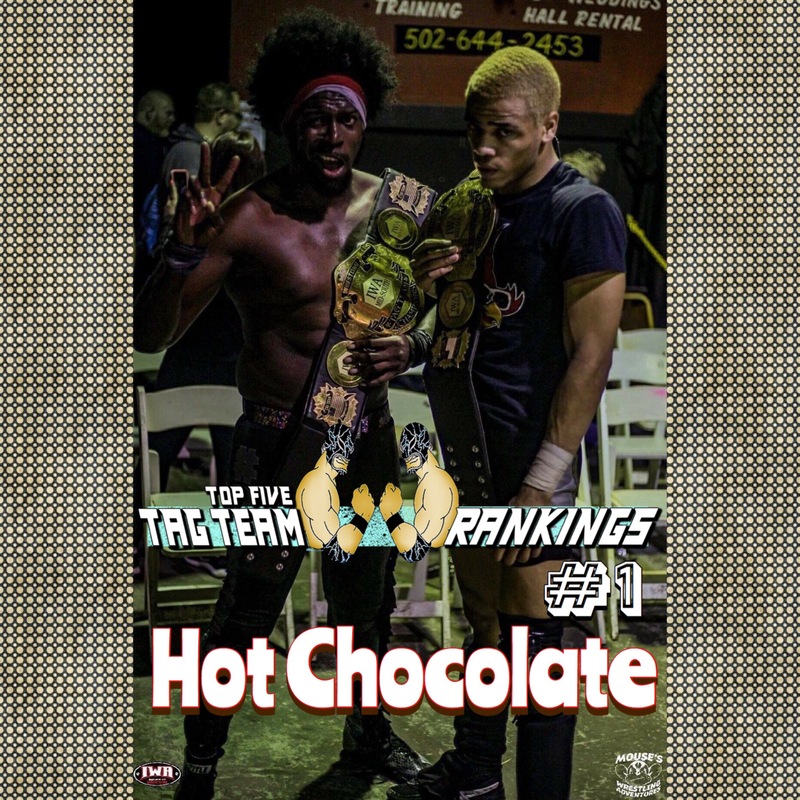 You get a winning combination and a #1 ranking in the Tag Team Top 5 for Hot Chocolate after winning the vacant IWA Mid-South Tag Team Titles. Against all odds (and oddsmakers) Sugar Dunkerton & “Hot Fire” Myron Reed teamed to beat Zachary Wentz and Brett Havoc in the First Round of the title tournament, then Larry D and Aaron Williams, and then The Ugly Ducklings to win the 2017 Candido Cup and the vacant titles. This team wasn’t expected to win the tournament for the titles, but they came out of nowhere to prove that you can’t count either of these superb talents out. Look for them to build on this win in the upcoming weeks and months. 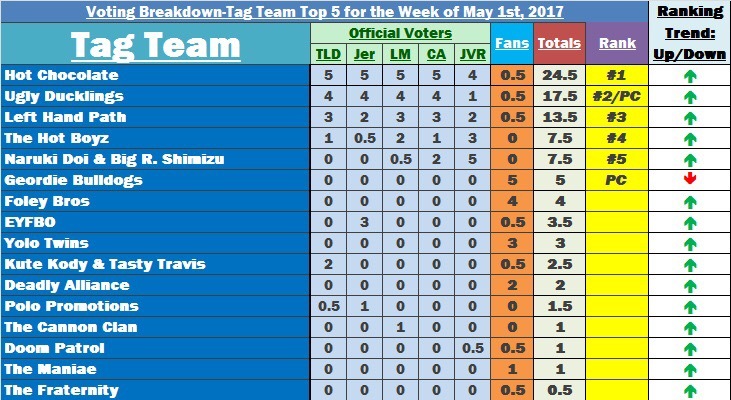 #2 Ugly Ducklings (Rob Killjoy & Lance Lude)-This team’s only loss came to this week’s #1! It was another great week for the Ducks as the Rockstar Pro, Premiere Wrestling Xperience Tag Team and 2/3rds of Premier Wrestling Federation Universal Six-Man Tag Team Champions fought Flip’n’Knees (Marcus Everett & Myron Reed) to a double pin on 4/26 at Rockstar Pro to retain the titles, then defeated The Rat Pack at IWA Mid-South on 4/27 in the first round of the tag title tournament, then defeated The Rejects (John Wayne Murdoch & Reed Bentley) in the semifinals, then lost to Hot Chocolate (Sugar Dunkerton and Myron Reed) in the final, then teamed with George South at WarZone Wrestling on 4/28 to defeat The Brutes (Mark James & Jimmy Parker) & James Drake, then defeated The Heatseekers (Russell Elliott & Sigmon) by DQ at West Virginia Championship Wrestling in a title match, and then defeated Roscoe Eat Lisa (Mikey McFinnegan & Zakk Sawyers) at PWX on 4/30 to retain the titles to go 5-1-1 for the week. Their phenomenal year just keeps getting better.